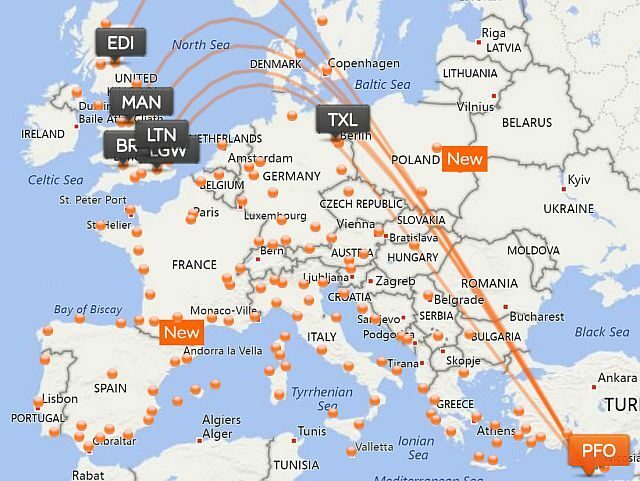 If you plan to visit Cyprus next summer, the next two Thursdays are significant dates for easyJet customers. With flights from regional airports around the UK including Luton, Gatwick, Manchester, Bristol and Edinburgh, an average aircraft age of only 6 years, and family-friendly policies such as free carriage of car and booster seats, and their low-cost ‘hands free’ option if you are happy to travel light, this airline is a popular choice for flights around Europe. Travellers can take toiletries and liquids in larger sizes than 100 ml without the faff of putting everything into zip lock bags. It also saves you lugging hand luggage through security and departures. And you can still take a small under-the-seat laptop or handbag on board. If you haven’t brought a bag, you will be provided with a small plastic bag at the bag drop for your valuables and essentials. You will be called to board after the ‘Speedy Boarders’ with your luggage tagged as ‘Priority’ to come off the carousel first. 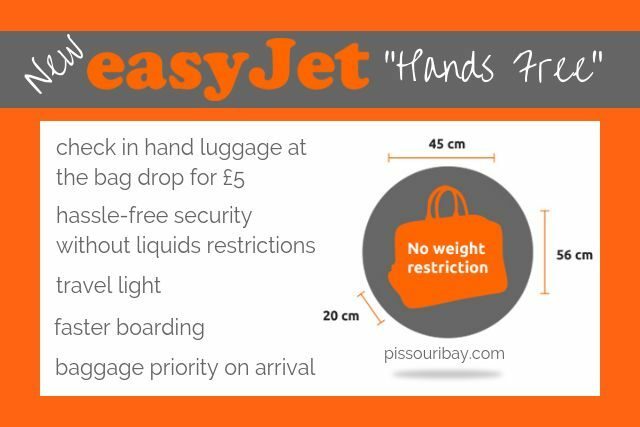 For easyJet it eases the congestion in the cabin overhead lockers, and adds another small ‘extra’ charge to your booking. To take advantage of the best rates, check out Availability Calendar and Contact Us to ask if we can reserve your preferred dates. Once agreed, we promise hold them for 24 hours which will allow you to book your flights. Then set your alarm for Thursday morning and hop onto the easyJet website… early risers get the best flight deals! 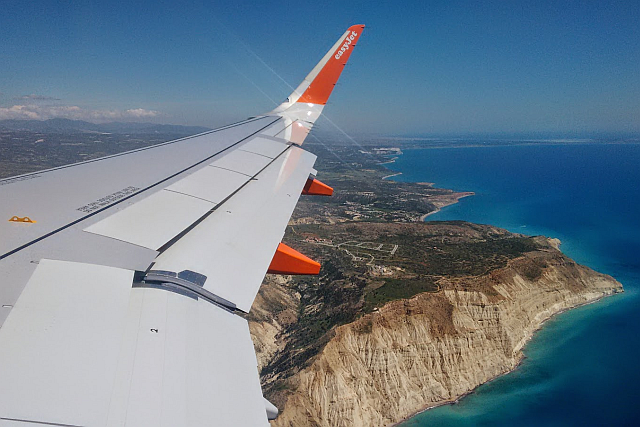 Our photo shows an easyJet Airbus A320 turning over Pissouri on its flight path to Paphos. Tip: to see a great aerial view of Pissouri on arrival, it’s often best to choose seats on the right-hand side of the plane. 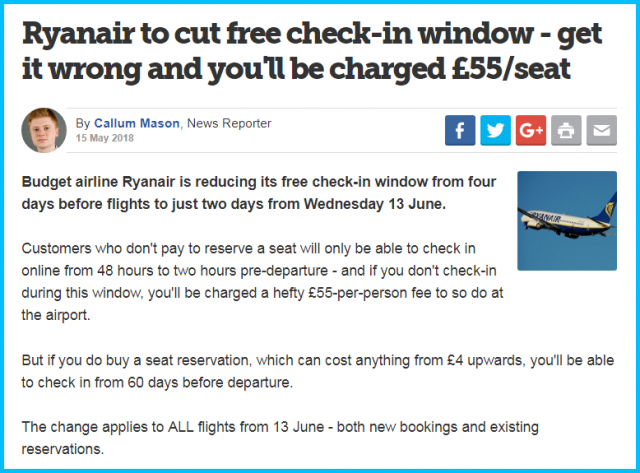 Don’t get caught out by Ryanair’s latest sneaky change – from 13 June you will only be able to check-in free of charge 2 days before your flight. Make sure you set yourself a reminder as it’s something that could easily get overlooked in your packing frenzy. Our photo shows an easyJet Airbus A320 turning over Pissouri on its flight path to Paphos. Tip: to see a great aerial view of Pissouri choose seats on the right-hand side of the plane. The planned schedule will run twice weekly throughout next summer from April 2018. 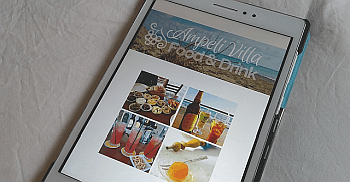 Book online from September. Dimitra Apatsidou of Ryanair has said that in order to celebrate the new route, the company would be releasing seats on sale to other destinations from Paphos from just €26.99 for travel in September, which are available for booking until midnight on Thursday August 31.